Have you ever wanted to learn how to cook like the chefs you see on tv? Have you wished you knew how to prepare healthy food so that it’s delicious AND pretty to look at? Anamaya has the solution to get you started! 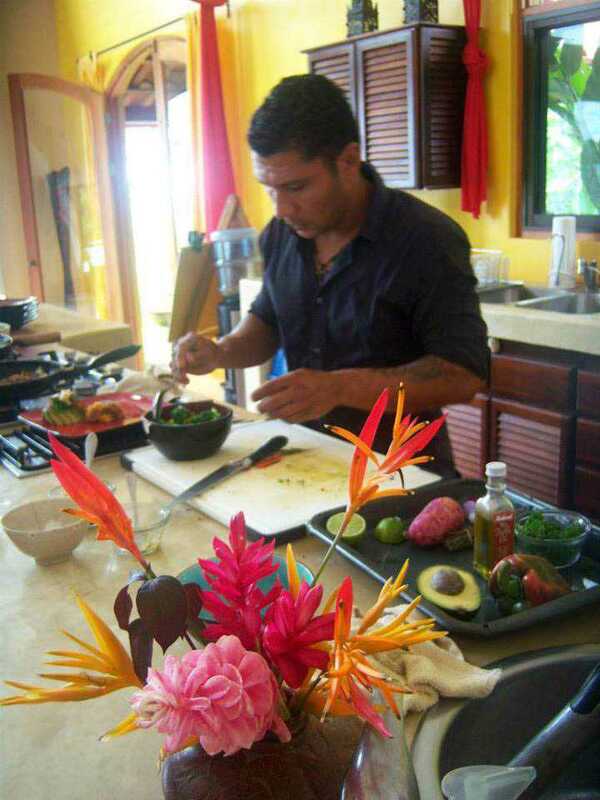 As a part of each one of our yoga retreat packages, we offer a cooking class free of charge. The cuisine at Anamaya is one of the most remembered parts of the retreat by our guests. A read through Anamaya’s reviews on TripAdvisor will demonstrate just how much of an impact the natural, healthy food has on both our retreat and Yoga Teacher Training guests. Many of the guests comment that they have never in their lives eaten as well as they did at Anamaya. Because everyone loves the food so much, we wanted to offer our guests the opportunity to learn some tricks of the trade, and take these with them to be able to enjoy a little piece of Anamaya at home. This 60-90 minute class is currently offered on Friday afternoons (subject to change) and is taught by one of our amazing bi-lingual kitchen artists. You will learn to cook various fresh and healthy dishes which may include; Costa Rica’s national dish- gallo pinto, burritos, salsas and dressings and delicious desserts such as coconut rice pudding. Feel free to take photos, and make notes during the class. Whether you are a seasoned home cook, or you don’t normally cook in daily life, you will be able to make these dishes and work from there to create impressive Costa Rican meals for your friends and family. Many of our guests have let us know that they have made the dishes they learned in class once they got home, and continue to work them into their regular meal rotation! All of the ingredients we use both at Anamaya and in the classes are fresh and natural. Many of the herbs and vegetables come from Anamaya’s very own farm, Rancho Delicioso! If you don’t happen to have your very own farm or garden, you should be able to find everything needed to make the recipes at home in your local farmers market or store. Guests love the opportunity to interact with the kitchen staff during the classes. Most the time the kitchen staff are working away in the production kitchen downstairs and only come into the guest kitchen to serve their amazing meals. The classes are a wonderful opportunity to get to know one of the team that feeds you during your time at Anamaya. Personal interactions with the staff at Anamaya are one of the key factors that lead to the feeling of everyone being family. This is one of the most special aspects of life at Anamaya, and it is truly valued by both the guests and the staff as well. Every one of us at Anamaya want you to enjoy your time with us, and each activity offered is geared towards helping you live a more healthy and fulfilling life. The cooking class is just one of many special offerings that we want you to experience and take home with you. Join us and feed yourself, body, mind and soul.